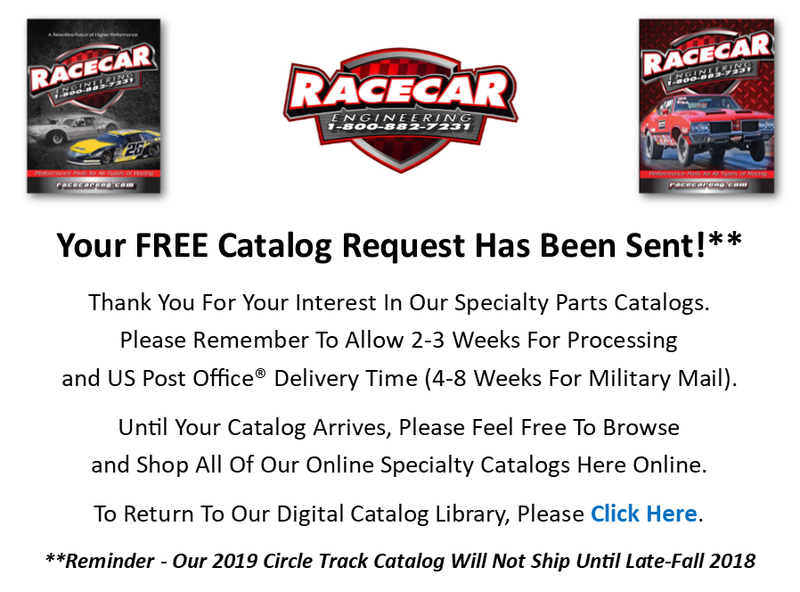 To receive your FREE copy of our Racecar Engineering™ Circle Track Parts Catalog or Drag Racing Parts Catalog, please complete and submit our catalog request form below. Please allow two (2) to three (3) weeks for processing and US Post Office® delivery time. In the meantime, please feel free to browse our catalogs online. To return to our Digital Catalog Library, please click here. This FREE catalog offer is valid for all consumers with a mailing addresses in the U.S.A. and all U.S. territories. Canadian and overseas consumers, please call us at 863-859-5438 or email us regarding receiving a printed catalog, as Customs Fees and/or Special Tariffs may apply. ATTENTION ACTIVE UNITED STATES MILITARY MEMBERS - We fully support our troops as you are heros in our eyes. We will ship our catalogs FREE-OF-CHARGE to all active-duty U.S. Military personnel using their assigned APO/FPO/DPO addresses. The catalog parcels will be sent via the US Postal Service® and can take 4 to 8 weeks for catalogs to arrive to the designated APO/FPO/DPO shipping address. When completing our Catalog Request form to an APO/FPO/DPO address, please follow the special instructions at the bottom of our Catalog Request form. We &apos;Thank You&apos; for your service! Don&apos;t Forget About Our Other Online Digital Specialty Catalogs! Please remember you can also browse and order online from our other market specific digital catalog publications. So whether you are into Open Wheel, Hot Rods and Early Muscle Cars, Late-Model Muscle Cars or strictly Engine Parts and Accessories, we have a catalog that we think you&apos;ll float your boat. Click here in revisit our entire Digital Catalog Library. APO/FPO/DPO CATALOG REQUEST FORM INSTRUCTIONS - Include your rank (if applicable) along with your first and last name in the NAME fields. Enter your Unit Information in the first ADDRESS field and please be as specific as possible. Type APO, FPO or DPO in the CITY field. Choose either AA (Armed Forces Americas), AE (Armed Forces Europe) or AP (Armed Forces Pacific) from the STATE field pull-down menu. ZIP CODE field should be the ZIP+4 format if possible to ensure proper routing and to minimize delays in receiving your catalog. IMPORTANT NOTE: On DPO addresses, please do not include the street address of the embassy or your job title.